One Bedroom Suites – Full Living, Kitchen and Dining Area. Most have a Queen Bed in the Bedroom and a Pull out* Queen Sofa. Units with King in bedroom are available at a slightly higher rate. Rates based upon up to 4 persons per unit max. We have some One Bedroom units with obstructed views due the stair well in front of the deck – these are our least expensive units. We have One – One Bedroom unit that is handicap accessible. All One Bedroom Suites are located on the First Floor. Two Bedroom Suites – Full Living, Kitchen and Dining Area. Most have a Queen Bed in each Bedroom and a Queen Pull-out* couch in the Living Room. Units with King in the Master bedroom are available at a slightly higher rate. Rates based upon up to 6 persons per unit max. All Two Bedroom Suites are 2 level units accessed on the second floor. Two Bedroom Loft Suites – Most have a Queen Bed in each Bedroom, a Queen Pull-out* couch in the Living Room and a Queen Pullout in the Loft Area. Loft Suites sleep up to 8. We have one Loft Suite with a King in the Master. *Pull Out Sofas are best suited for children or small adults as most adults simply do not find them comfortable. 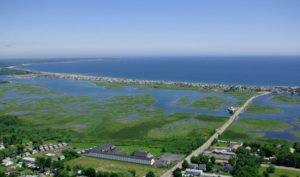 Unit 135 is a One Bedroom End Unit with king bed, small extra private Deck and a Slider overlooking Rachel Carson Wildlife Refuge, higher rates apply. Kids FREE: Kids 12 & Under Stay Free. Kids do count toward overall occupancy of the unit which cannot be exceeded. Holiday and Special Event Charges: Higher rates and minimum stays may apply for some holiday and Special Event dates including but not limited to; Memorial Day Weekend, Around July 4th, Labor Day & Columbus Day, Prelude & Christmas by the Sea weekends. Minimum Stays: 2 Night Minimum stay is often required. All rates subject to change without notice and only confirmed for deposited reservations. No Check Ins prior to 3PM: We fully appreciate you are anxious to start your vacation as soon as you arrive. We can make no guarantees of check in before 4pm and no check ins until 3pm at the earliest. If you would like to arrive prior to that, you are welcome to use our grounds and pool area and of course the beach. We recommend you pack a small day bag with swimsuit and you are welcome to use the changing facilities in the pool area. Parking is limited: Guests are allowed one parking spot per a 1 or 2 bedroom unit and two for a loft style unit. Parking will be checked nightly and additional charges will apply for all unauthorized vehicles, trailers etc. Unregistered vehicles will be towed. Check with registration office for additional information on parking. Sunday Nights Charged at Weekend Rate and no Saturday night only stays: Presidents/Valentine, Memorial Day, Labor Day and Columbus Day Sundays. New Years Eve – Dec 31 – No One Night Stays. *Savings are off regular season peak nightly rate and reflected in rates shown. Deposit: One Night stay is due in full at time of reservation. 50% deposit is due for two or more night stays. Payments: Balance is due at check-in, and is payable either by Cash, MasterCard, Visa, Discover or Travelers Checks. No personal checks accepted at check-in. Note about using Debit cards: We will request a pre-authorization from your bank at check-in for your balance due and/or security deposit. This places a hold on these funds until check-out, funds are then either transferred or released. However it may take the bank up to 10 days to completely release the hold. For this reason we strongly recommend an alternative payment option other than debit card for your balance and security deposit. Security Deposit: Misty Harbor requires a Security Deposit for incidental charges and/or possible damages/ excessive clean-up, including but not limited to unauthorized pets or smoking in a room. Because all units are individually owned, we strictly enforce unit inspection at check-out. You will be charged for any excessive clean-up, loss or damages including compensation to other guests required due to excessive noise or disturbances after quiet hour. Cancellation Policy: If cancelled 10 days prior to scheduled arrival, a refund will be issued minus a $25 service charge for any stay of less than a week. Cancellation of reservations of a week or more will be issued a refund minus a $100 service charge per week rented. If cancelled less than 10 days to scheduled arrival, no refund will be issued. No refunds on early departures. Room Requests: Specific room location requests will be honored whenever possible, but not guaranteed. No Smoking: All of our units are non-smoking. Guests may smoke in designated locations only. Guests are no longer allowed to smoke on decking out front of units. **Marijuana smoking and “vaping” are not allowed anywhere on the property. Late Arrivals: Please advise the office of late arrivals. Pets: Sorry, no pets are allowed on the property. Scheduled Pool Maintenance: Our pool will be closed for maintenance May 6-15, 2019 and October 21-25, 2019. We apologize in advance for this inconvenience.